The hard-knocking, later-maturing Include mare Participate will retire to the life of a broodmare in 2019, and is slated to be a part of the first book of mares covered by the brilliant new Maryland stallion Irish War Cry in a Housatonic Recommended Mating. This pairing is one that will hopefully inject a bit of speed and precocity into Participate’s first foal, without picking a mate that would tend so far towards the speedy end of the spectrum as to be an apples-to-oranges mating of the type that works much less often than breeders would want. Participate’s five career victories came at 4- and 5-years-old, from one mile to 1-1/8 miles, on both dirt and turf. And while that distance range was probably where Irish War Cry himself was at his best (having won the Grade 2 Holy Bull and Wood Memorial stakes at 1-1/16 miles and 1-1/8 miles, respectively), and he was a Grade 3 winner at 4, he was also an unbeaten 2-year-old at 6 and 7 furlongs and had his most successful campaign at 3, when he won those two Graded Kentucky Derby prep races before finishing second in the classic Belmont Stakes. So while we would hope that the foal from this match would come to hand a little earlier than Participate herself did, there is also every reason to think that foal will continue to improve with a bit of distance and maturity. There is also enough turf ability in Irish War Cry’s pedigree to suggest that his offspring will run on that surface depending on the proclivities of his mates, so this foal could have some versatility, as well. As tall, well-balanced horses with plenty of leg, Irish War Cry and Participate also make a very nice like-to-like physical pairing. Finally, this mating has plenty to recommend it on pedigree, too. Participate’s sire, Include, has had most of his success as a broodmare sire with stallions from the Mr. Prospector male-line, like Irish War Cry, a trend which also applied to the daughters of Include’s sire Broad Brush. 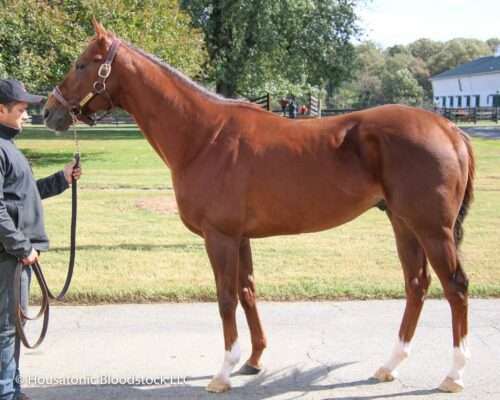 Meanwhile, Irish War Cry’s sire, Curlin, is also the sire of a Grade 3 winner with a second dam by Broad Brush, from just nine foals he has sired with Broad Brush in the first or second generation of their dams’ pedigrees. Participate’s female family has been less successful with Mr. Prospector-line stallions in recent generations (though under her third dam there is a stakes winner by Not For Love, and under her fourth dam there are stakes-caliber runners by Not For Love and Mutakddim), but the best horse appearing under Participate’s second dam is Polish Rifle, a son of Polish Numbers — and Polish Numbers happens to be the broodmare sire of Irish War Cry. Polish Numbers also happens to be out of the “Blue Hen” mare Numbered Account, and the foal from this mating will be inbred to her 4×5, since Numbered Account is also the dam of Private Account, the sire of Participate’s broodmare sire, Valley Crossing. Inbreeding to Numbered Account 4×4 has produced 4% stakes winners/foals, so the duplication in this mating cannot be a bad thing. Taken as a whole, this is a match-up that we are very excited about and expect will produce a successful first foal to kick off Participate’s breeding career.